Back in May we told you more online services were coming your way. We’re pleased to announce that ‘Tell DVLA you've sold or bought a vehicle’ has successfully passed the Government Digital Service assessment and is now available in public Beta. As with all new services we’re looking for your feedback which will help us to continuously improve the services for you. by using the service ‘sold a vehicle out of trade’. Before using the online service you’ll need the latest registration certificate (V5C). 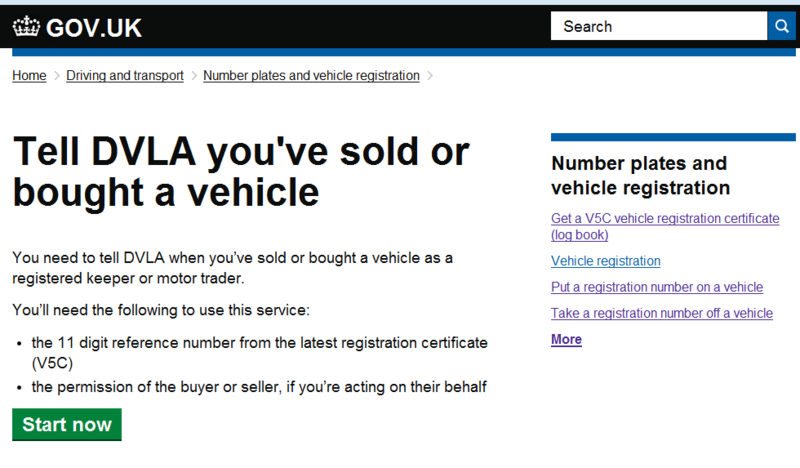 ‘sold your vehicle to a private individual or business’ - private individuals can now tell DVLA when they sell their vehicle to another private individual or business. We’ll continue to use your feedback to continuously improve these services. This will make sure that they are ‘simple, better and safer’ for you, our customers. I was just wondering if this method would generate a new V5 with the new keepers details or whether the V5 still needs to be sent to the DVLA. What happens to unused months of tax when you sell a vehicle? WHY can't tax be 6 /12 months from the day you pay NOT the 1st of each month, can't be that hard these days ! I bought a car on the 22nd of Dec and had to pay from the 01st Dec, The previous owner also couldn't claim the tax back for that month, so the DVLA have 2 lots of tax for the same car for the same month....is this fraud/theft ? Vehicle tax is required by law and if legislation were changed in order to allow vehicle tax to commence and end on any day of the month, there would be a considerable increase to the calculations for each rate of duty. This would result in a substantial increase in resources and significant development costs, which would ultimately have to be passed on to the taxpayer. Future decisions will rest on the policy priorities of government. Any potential revenue gains are likely to be offset by motorists receiving a refund, which they may not have received prior to 1 October. As you know to get a refund for each full calendar month left on the vehicle tax, you must notify DVLA before the end of the month. With the introduction of this new electronic channel which allows you to notify the sale of your vehicle online....all transactions will update in real-time. When a sale is notified at 23:59 hours on any calendar month, any refund due will be paid for complete calendar months remaining, from the date the transaction was made. is this something that will be introduced as well? Delivery of a permanent export online service will be considered as part of VMPR2. The timeline for this has yet to be confirmed. Once we have more information on future developments we will communicate via our digital blog/Inside DVLA services. I purchased a used car from a dealer on the 16th July and was informed by them that they had sent,on my behalf,the log book with my details as the new owner. How long will it be before I receive the new log book as I am still waiting for it. Can I renew my road tax before I receive a letter from you telling me it is due? I can't find my V5C form, how can I get a replacement?